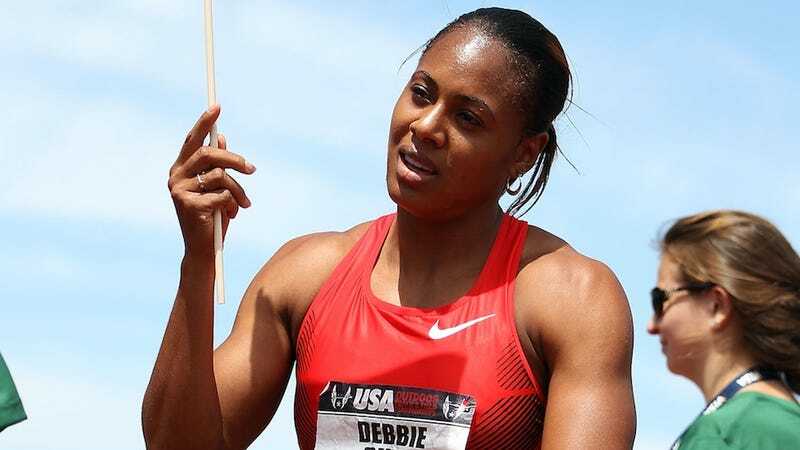 Olympics-bound sprinter Debbie Dunn has gone from Team USA to Team What the Hell Where You Thinking Oh My God — she tested positive for anabolic steroids at the Olympic trials and is now off the team. In an age of rigorous drug testing, what in the world would possess an athlete to dope? USADA chief executive Travis Tygart said in a statement to the Tribune that analysis of the sample Dunn gave at the Olympic trials also indicated an adverse carbon isotope ratio, which is used to determine whether exogenous testosterone is present. A testosterone / epi ratio over 4:1 is considered elevated. In most men, the ratio is 1:1, and it is less than 1:1 in women. Officials stress that Dunn is innocent until proven guilty, and they still have to evaluate a second sample she provided at the time of the trials. It's not completely impossible that Dunn's test registered a false positive; eating meat of animals that were given steroids can elevate levels of certain chemicals in a person's blood, as can certain prescription drugs which Dunn was most likely not taking.